The Boston Red Sox still own Major League Baseball's best record in the early going, now standing strong at 17-4. But with Sunday's 4-1 loss to the Oakland Athletics, the Red Sox have now lost back-to-back games for the first time in 2018. Less than 24 hours after being no-hit by Oakland starter Sean Manaea, Boston's bats continued to struggle. The team got its lone run in the top of the seventh inning, when Brock Holt doubled in Rafael Devers to tie the game at 1-apiece. The Red Sox appeared to be in decent shape, with David Price cruising. After giving up a single run in the bottom of the first inning, Price settled down to allow Boston a chance to get to A's starter Daniel Mengden. 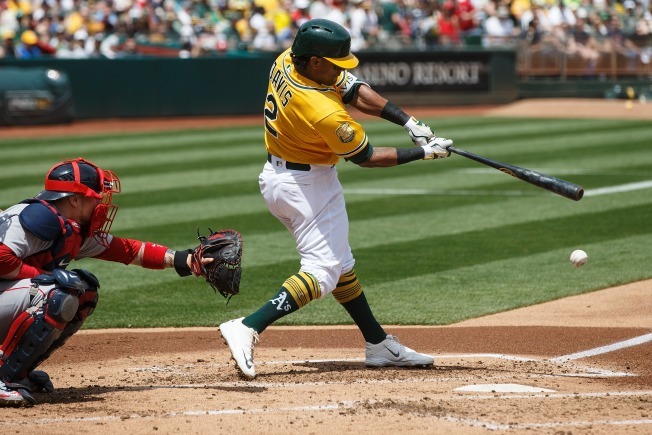 But the team was just 1 for 8 with runners in scoring position on the afternoon, and Price's solid outing turned sour in the eighth inning when he served up a three-run homer to Oakland slugger Khris Davis to make it 4-1 A's. Holt reached base safely on an error with two outs in the ninth inning to briefly keep the Red Sox alive before Christian Vazquez popped out. Boston is off tomorrow before it begins a three-game series in Canada with the Toronto Blue Jays. Toronto is 13-8, four games back of the Red Sox for first place in the AL East.